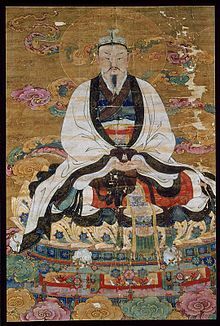 The Jade Emperor (Chinese: 玉皇; pinyin: Yù Huáng or 玉帝, Yù Dì) in Chinese culture, traditional religions and myth is one of the representations of the first god (太帝 tài dì). In Daoist theology he is the assistant of Yuanshi Tianzun, who is one of the Three Pure Ones, the three primordial emanations of the Tao. He is also the Cao Đài ("Highest Power") of Caodaism known as Ngọc Hoàng Thượng đế. In Buddhist cosmology he is identified with Śakra. In Korean mythology he is known as Haneullim. The Jade Emperor is known by many names, including Heavenly Grandfather (天公, Tiān Gōng), which originally meant "Heavenly Duke", which is used by commoners; the Jade Lord; the Highest Emperor; Great Emperor of Jade (玉皇上帝, Yu Huang Shangdi or 玉皇大帝, Yu Huang Dadi). In the popular novel by Wu Cheng'en, the Jade Emperor is featured many times. Once a great drought had spread across the land. Four dragons from the sea noticed the plight of the people and traveled to beseech The Jade Emperor in the Heavenly Palace to bring the rains to the people. He was very busy ruling the heavens, earth, and sea and distractedly agreed to the send the rains on the next day if they would return to the sea, but soon after the dragons departed, he forgot his promise. After ten days, the rains still did not come and the people began to die of starvation. The dragons could not simply stand by and do nothing, and so they decided to use their bodies to capture great masses of water from the sea, taking it upon themselves to bring the rain. The people were grateful and prayed their thanks to the Jade Emperor, who soon discovered what the dragons had done, and became angry that they intervened without his blessing. The Jade Emperor ordered Mountain God to trap the four dragons. However, from each mountain that trapped a dragon there sprung a new river. From Yellow Dragon came the Yellow River, from Long Dragon the Yangtze River, from Black Dragon the Amur River, and from Pearl Dragon the Pearl River. The rivers thereafter flowed from west to east and north to south, the dragons ensuring that the peoples of China would never be without water again. The Jade Emperor was originally the assistant of the Divine Master of the Heavenly Origin, Yuanshi Tianzun. Yuanshi Tianzun is said to be the supreme beginning, the limitless and eternal creator of Heaven and Earth, who picked Yu-huang, or the Jade Emperor, as his personal successor. The Jade Emperor will eventually be succeeded by the Heavenly Master of the Dawn of Jade of the Golden Door (金闕玉晨天尊). The characters for both are stamped on the front of the arms of his throne. In two folk automatic writing texts produced in 1925 and 1972, Guan Yu became the 18th Jade Emperor in about 1840 AD; however, some have disagreed that Guan Yu has succeeded, and thus the Jade Emperor and Guan Yu are often worshiped separately. In Tienti teaching, the reigning Jade Emperor has 55 predecessors. In the morning of this birthday, Chinese, Taiwanese as well as Hokkien and Peranakan Malaysian Chinese and Singaporean Chinese who practice Buddhism, Taoism and other traditional Chinese religions set up an altar table with 3 layers: one top (containing offertories of six vegetables (六齋), noodles, fruits, cakes, tangyuan, vegetable bowls, and unripe betel, all decorated with paper lanterns) and two lower levels (containing the five sacrifices and wines) to honor the deities below the Jade Emperor. The household then kneels three times and kowtows nine times to pay homage and wish him a long life. 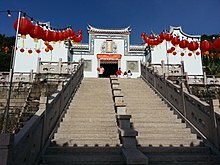 In Penang, Malaysia, a focal point of the Jade Emperor's Birthday celebrations is Thni Kong Tnua, which gained worldwide fame as one of the featured locations for The Amazing Race 16. The temple, built in 1869, is located at the foot of Penang Hill at the Air Itam suburb near George Town, Penang's capital city. Aside from Thni Kong Tnua, the Chew Jetty in the heart of George Town is another focal point of the Jade Emperor's Birthday celebrations; the festivities in this particular location was captured for a 2014 Malaysian film, The Journey. Yuk Wong Kung Tin (玉皇宮殿) also known as Yuk Wong Po Tin (玉皇寶殿) is a temple in A Kung Ngam, Hong Kong, dedicated to the Jade Emperor. In the mid 19th century, people from Huizhou and Chaozhou mined stones in the hill for the development of the central urban area. They set up a shrine to worship Yuk Wong. At the beginning of the 20th century, the shrine was developed into a small temple and was renovated many times. The latest renovation was in 1992. ^ "Temple of Jade Emperor God - Community | The Star Online". www.thestar.com.my. Retrieved 2017-05-16. ^ II, Administrator. "Amazing Race Season 16, Episode 8". www.visitpenang.gov.my. Archived from the original on 2018-05-07. Retrieved 2017-05-16. ^ "Hokkiens go all out to celebrate Jade Emperor God's birthday at jetty and temple - Community | The Star Online". www.thestar.com.my. Retrieved 2017-05-16.